Readers of a certain age might remember the old Bugs Bunny cartoon where our hero wakes up in the morning to find an interstate highway being built around his rabbit hole. He spends the rest of the cartoon outwitting the construction workers to such an extent that they build the highway around his modest home. Bugs' victory became real to me many years ago when my mom told me the story of how Interstate 278 was almost built through our living room in the late '60s. Apparently, my parents had bought my childhood home in Union without knowing that the neighborhood was on a Department of Transportation map of the planned highway extension linking Staten Island with the then-yet-to-be-built Route 78 near the Union-Millburn border. Earlier commercially-sold maps show a route that would have preserved our immediate neighborhood, but the impact on the town would have been immense with that route, too. Already criss-crossed by the Garden State Parkway and U.S. Route 22, Union would have changed dramatically, with an entire section of town cut off from the rest. 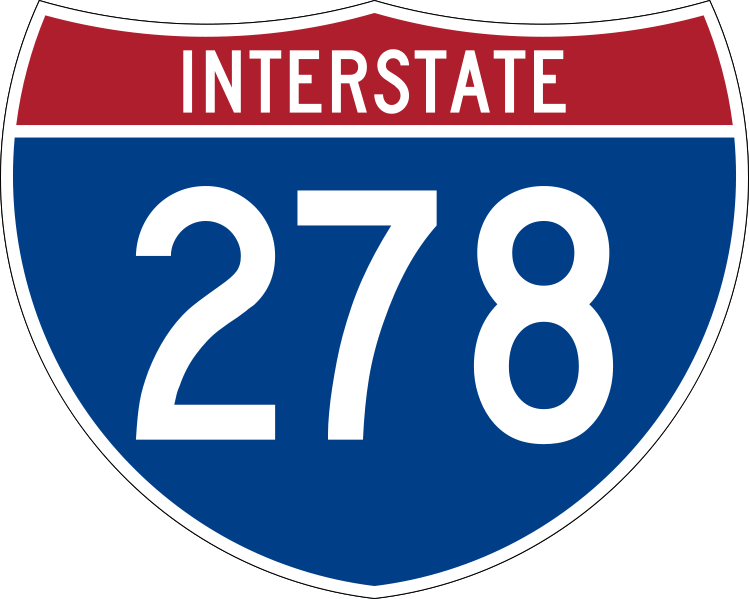 Plans for I-278 had been announced in the mid 1950s as part of a Federal government program to replace existing U.S. highways. According to a 1958 New York Times article, U.S. 1 would be replaced by Interstate 95, U.S. 46 replaced by 80, U.S. 22 replaced by 78, and so on. 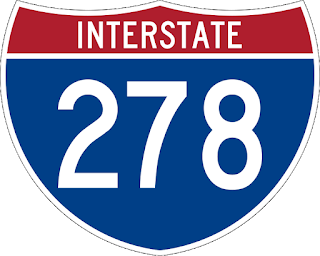 Planned as a secondary, or spur road, 278 would also be called the Union Freeway and was expected to divert Union County-bound traffic off Route 78 while relieving pressure on State Highway 28. As we know today, the interstates didn't replace the older New Jersey highways as much as they provided a less commercial, limited-access alternative that eventually got equally as congested as populations grew. And unlike a lot of the construction done in less populated areas of the country, parts of some of these highways would be built through thriving, densely built-up communities. The notorious urban planner Robert Moses had already pushed the construction of the New York portion of 278 in the 1960s by force of will, tearing up neighborhoods as it meandered through four of New York City's five boroughs. Fortunately, New Jersey lacked a personality of Moses' stature to force the road through. That's where my family's story comes in. By the mid 1960s, Union, Roselle Park and Kenilworth residents living in the path of 278 were up in arms over the potential of losing their homes to a six-lane expressway. 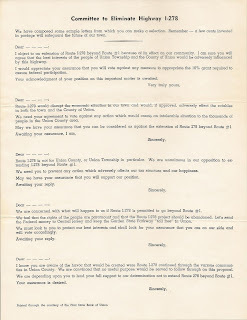 The Committee to Eliminate Highway I-278 was formed to organize Union residents in protest to state and Federal elected officials. 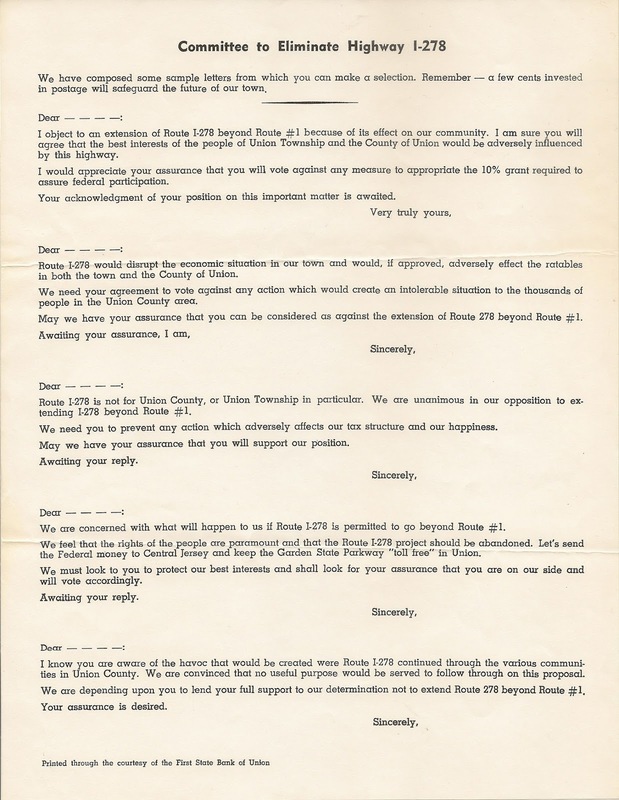 I haven't been able to find much yet about the committee but discovered a letter sent to residents with office holders' names and contact information. Organizers claimed that more than 550 homes and 24 commercial properties would be claimed by eminent domain, pulling as much as $15 million in rateables off the tax rolls. Local outrage eventually prevailed, and all that was built of 278 in New Jersey was a stub of a highway that opened in 1969, linking Route 1 in Linden to the Goethals Bridge in Elizabeth. Once the rest was effectively killed, the allocated funding went toward the Central Jersey Expressway, now known as Interstate 195. And, of course, my family and I were able to continue to enjoy our home, unbothered by the inconvenience of being relocated by a six-lane interstate.